First, bravo! Another modern-day ensemble acknowledges the importance of placing the B♭-Major Quartet’s Grosse Fuge ahead of the alternate finale. The resisters, like the recently reviewed Shanghai Quartet, are in an ever-growing minority, one that, in my opinion, deserves to be discredited. Second, bravissimo! 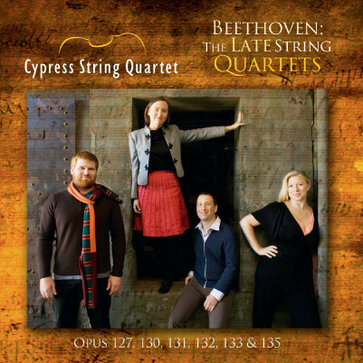 The Cypress String Quartet’s traversal of Beethoven’s late quartets is the best, bar none, I’ve yet to encounter. These are performances of a technical perfection and keenness of interpretive insight that one is apt to hear only in the mind’s inner ear. Tiny details seen in the score but almost never heard are revealed with crystalline clarity. For example, in the opening Adagio measures of the B♭-Major Quartet, how often does one actually hear the C-G double-stop in the viola part on the upbeat to the sixth full bar? Yet here it is, as clear as can be, to no small degree the result of the Cypress Quartet players’ scrupulous observance of every one of Beethoven’s crescendo swells to a p and a recording of unusual penetrability. But there’s something that goes way beyond following the composer’s dynamic and phrasing instructions or taking the lengthy exposition repeat, and it has to do with a musical intuition and vision of the work that, frankly, strikes me like a bolt of lightning. Every one of the quartet’s six movements, including the Grosse Fuge (seven if you count the alternate finale), and not just the Alla Danza , is played as if it were a dance. As many times as I’ve heard this quartet, it never before occurred to me that it’s as much an “apotheosis of the dance” as is the composer’s Seventh Symphony. Each of the quartet’s movements is informed by a stylized dance form of one type or another. The first movement opens with a stately entrée grave in 3 and then proceeds to alternate with a lively, vigorous, bounding type of dance in 4, perhaps a galliard. The second movement (Presto) in cut time might easily have its roots in the tarantella. The third movement (Poco scherzoso) bears certain characteristics of a gavotte. The fourth movement (Alla Danza) is a sad little Viennese waltz. The fifth movement (Cavatina) is, of course, the quartet’s sarabande, and the alternate finale could well be a rigaudon or tambourin. That leaves the Grosse Fuge , which in this context now becomes all important and lays claim to its hierarchical position as the quartet’s rightful conclusion, for it embodies all of the dance impulses that precede it. When you listen to the Cypress Quartet play this work, you will hear Beethoven’s B♭-Major Quartet as the dance suite it probably is, and you will quite literally hear the music dancing. This is a very special performance, but it’s not the only one. The A-Minor Quartet’s great “Heiliger Dankegesang” is of a transfixing concentration and intensity that will melt your heart and bore a hole through your soul. And again, the combination of the ensemble’s clarity of voicing and the transparency of the recording expose every tiny scrap of filigree in the contrasting andante sections of the movement. This is music-making that will hold you absolutely spellbound in its thrall. If reverence and awe, then joyful embrace, are Beethoven’s vision of a personal God in the “Heiliger Dankegesang,” what vision does he impart in the cold, impersonal, remote, and alien cosmogony of the C♯-Minor Quartet’s opening fugue? Is it that of Schubert peering into the dark, fathomless abyss? No, it’s the vision, rather comforting in its own way, of a universe neither benevolent nor malevolent, but unmindful of us and unfolding as it should. The key to capturing the essence of this music is not to play it devoid of expression but to play it with an expression that expresses expressionlessness. This the Cypress Quartet achieves with a feeling of aloofness and detachment conceived most immaculately. Exothermic vs. endothermic—all-embracing warmth vs. calculated cold in the two preceding quartets. Where does Beethoven go from here? To foppery and tomfoolery in the final F-Major Quartet, a work filled mostly with good-natured humor and a generosity of spirit. But there remains the quartet’s Lento assai, a movement that, with its concluding autistic suspensions repeated over and over again, foretells the Mahlerian leave-taking—“ewig … ewig … ewig”—at the end of Das Lied von der Erde. From my very first encounter with the San Francisco-based Cypress String Quartet in 33:2, I knew this was not just another string-quartet ensemble, that this was a group of special talent that was marked for greatness. I noted then the awesome technical resources and communicative expressiveness of these players and singled them out as my then current favorites in this repertoire. Nothing has changed since I made those statements. If anything, the completion of this set of Beethoven’s late quartets with the Nos. 12 and 15 has only reinforced my feelings. I would now pick the Cypress String Quartet over the Cleveland, Emerson, Artemis, Endellion, and Takács quartets and the Tokyo Quartet’s recent remake. It will now be a shame, and a major disappointment, if the Cypress String Quartet does not complete its Beethoven cycle with the early and middle quartets. This is potential Want List material and urgently recommended. Copyright 2012 Cypress Performing Arts Association.